From a culture that celebrates all things selfie comes the next logical extension. An invention that will surely delight any image-conscious narcissist. The “selfie arm” is a wonderful tongue-firmly-in-cheek invention of artists Aric Snee and Justin Crowe. Their aim, to comment on the illusion of sociableness and connectedness. Thankfully they plan to only construct 10 of these contraptions. But, you know, somewhere and soon, a dubious entrepreneur will be hawking these for $19.95. One can only hope that the children of Gen-Selfie will eventually rebel against their self-absored parents — until then I’m crawling back under my rock. 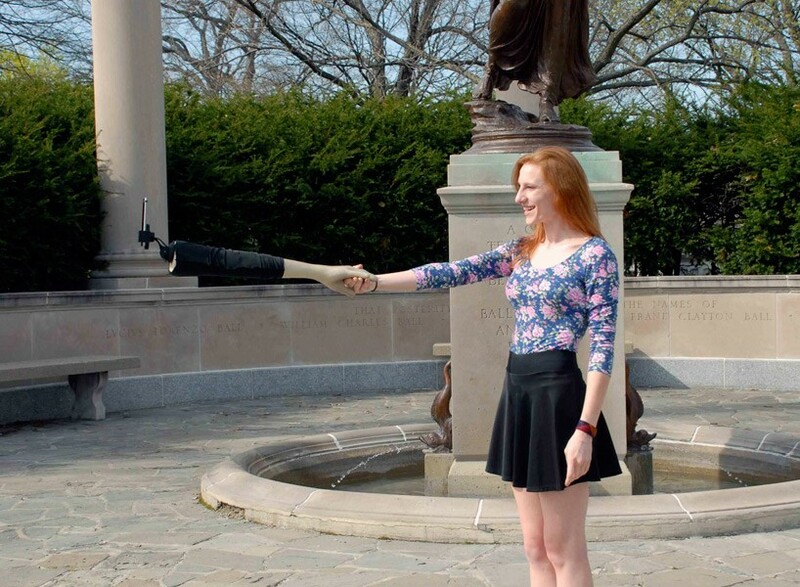 A selfie stick designed to look like a human arm will ensure you never look alone, but always feel alone. The accessory is designed to make it appear that a lover or friend is holding your hand while taking a photo, removing the crushing sense of narcissistic loneliness otherwise swamping your existence. The prototype ‘selfie arm’ is the work of artists Justin Crowe and Aric Snee and isn’t intended to be taken seriously. Made of fibreglass, the selfie arm was created in protest against the “growing selfie stick phenomenon, and the constant, gnawing need for narcissistic internet validation,” according to Designboom. Image: Selfie arm by Aric Snee and Justin Crowe. Courtesy of Aric Snee and Justin Crowe. The smartphone and its partner in crime, the online social network, begat the ubiquitous selfie. The selfie begat the self-stick. And, now we have the selfie museum. This is not an April Fool’s prank. Quite the contrary. 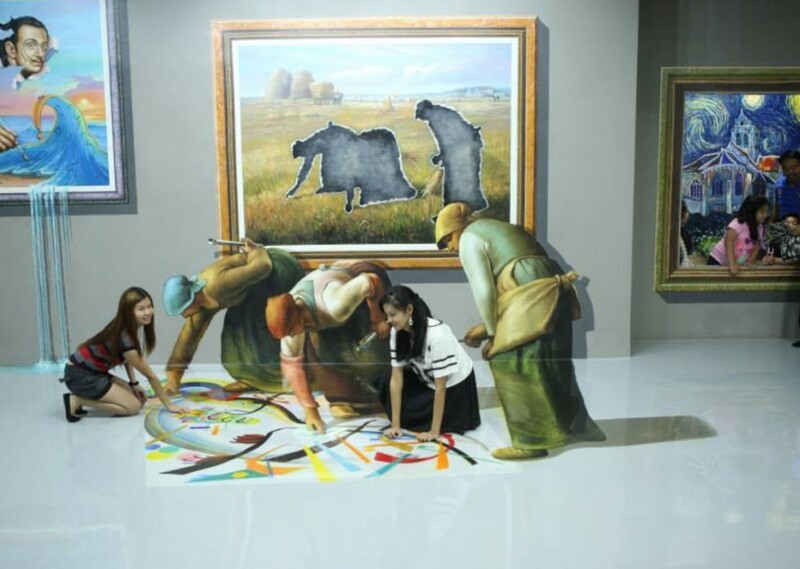 The Art in Island museum in Manila is making the selfie part of the visitor experience. Despite the obvious crassness, it may usher in a way for this and other museums to engage with their visitors more personally, and for visitors to connect with art more intimately. Let’s face it, if you ever try to pull a selfie-like stunt, or even take a photo, in the Louvre or the Prado galleries you would be escorted rather promptly to the nearest padded cell. Image: Jean-François Millet’s gleaners break out of his canvas. The original, The Gleaners (Des glaneuses) was completed in 1857. Courtesy of Art in Island Museum. Manila, Philippines. Technologist Marc Goodman describes a not too distant future in which all our appliances, tools, products… anything and everything is plugged into the so-called Internet of Things (IoT). The IoT describes a world where all things are connected to everything else, making for a global mesh of intelligent devices from your connected car and your WiFi enabled sneakers to your smartwatch and home thermostat. You may well believe it advantageous to have your refrigerator ping the local grocery store when it runs out of fresh eggs and milk or to have your toilet auto-call a local plumber when it gets stopped-up. But, as our current Internet shows us — let’s call it the Internet of People — not all is rosy in this hyper-connected, 24/7, always-on digital ocean. What are you to do when hackers attack all your home appliances in a “denial of home service attack (DohS)”, or when your every move inside your home is scrutinized, collected, analyzed and sold to the nearest advertiser, or when your cooktop starts taking and sharing selfies with the neighbors? Goodman’s new book on this important subject, excerpted here, is titled Future Crimes. If we think of today’s internet metaphorically as about the size of a golf ball, tomorrow’s will be the size of the sun. Within the coming years, not only will every computer, phone and tablet be online, but so too will every car, house, dog, bridge, tunnel, cup, clock, watch, pacemaker, cow, streetlight, bridge, tunnel, pipeline, toy and soda can. Though in 2013 there were only 13bn online devices, Cisco Systems has estimated that by 2020 there will be 50bn things connected to the internet, with room for exponential growth thereafter. As all of these devices come online and begin sharing data, they will bring with them massive improvements in logistics, employee efficiency, energy consumption, customer service and personal productivity. This is the promise of the internet of things (IoT), a rapidly emerging new paradigm of computing that, when it takes off, may very well change the world we live in forever. The Pew Research Center defines the internet of things as “a global, immersive, invisible, ambient networked computing environment built through the continued proliferation of smart sensors, cameras, software, databases, and massive data centres in a world-spanning information fabric”. Back in 1999, when the term was first coined by MIT researcher Kevin Ashton, the technology did not exist to make the IoT a reality outside very controlled environments, such as factory warehouses. Today we have low-powered, ultra-cheap computer chips, some as small as the head of a pin, that can be embedded in an infinite number of devices, some for mere pennies. These miniature computing devices only need milliwatts of electricity and can run for years on a minuscule battery or small solar cell. As a result, it is now possible to make a web server that fits on a fingertip for $1. The microchips will receive data from a near-infinite range of sensors, minute devices capable of monitoring anything that can possibly be measured and recorded, including temperature, power, location, hydro-flow, radiation, atmospheric pressure, acceleration, altitude, sound and video. They will activate miniature switches, valves, servos, turbines and engines – and speak to the world using high-speed wireless data networks. They will communicate not only with the broader internet but with each other, generating unfathomable amounts of data. The result will be an always-on “global, immersive, invisible, ambient networked computing environment”, a mere prelude to the tidal wave of change coming next. The broad thrust sounds rosy. Because chips and sensors will be embedded in everyday objects, we will have much better information and convenience in our lives. Because your alarm clock is connected to the internet, it will be able to access and read your calendar. It will know where and when your first appointment of the day is and be able to cross-reference that information against the latest traffic conditions. Light traffic, you get to sleep an extra 10 minutes; heavy traffic, and you might find yourself waking up earlier than you had hoped. When your alarm does go off, it will gently raise the lights in the house, perhaps turn up the heat or run your bath. The electronic pet door will open to let Fido into the backyard for his morning visit, and the coffeemaker will begin brewing your coffee. You won’t have to ask your kids if they’ve brushed their teeth; the chip in their toothbrush will send a message to your smartphone letting you know the task is done. As you walk out the door, you won’t have to worry about finding your keys; the beacon sensor on the key chain makes them locatable to within two inches. It will be as if the Jetsons era has finally arrived. While the hype-o-meter on the IoT has been blinking red for some time, everything described above is already technically feasible. To be certain, there will be obstacles, in particular in relation to a lack of common technical standards, but a wide variety of companies, consortia and government agencies are hard at work to make the IoT a reality. The result will be our transition from connectivity to hyper-connectivity, and like all things Moore’s law related, it will be here sooner than we realise. The IoT means that all physical objects in the future will be assigned an IP address and be transformed into information technologies. As a result, your lamp, cat or pot plant will be part of an IT network. Things that were previously silent will now have a voice, and every object will be able to tell its own story and history. The refrigerator will know exactly when it was manufactured, the names of the people who built it, what factory it came from, and the day it left the assembly line, arrived at the retailer, and joined your home network. It will keep track of every time its door has been opened and which one of your kids forgot to close it. When the refrigerator’s motor begins to fail, it can signal for help, and when it finally dies, it will tell us how to disassemble its parts and best recycle them. Buildings will know every person who has ever worked there, and streetlights every car that has ever driven by. All of these objects will communicate with each other and have access to the massive processing and storage power of the cloud, further enhanced by additional mobile and social networks. In the future all objects may become smart, in fact much smarter than they are today, and as these devices become networked, they will develop their own limited form of sentience, resulting in a world in which people, data and things come together. As a consequence of the power of embedded computing, we will see billions of smart, connected things joining a global neural network in the cloud. In this world, the unknowable suddenly becomes knowable. For example, groceries will be tracked from field to table, and restaurants will keep tabs on every plate, what’s on it, who ate from it, and how quickly the waiters are moving it from kitchen to customer. As a result, when the next E coli outbreak occurs, we won’t have to close 500 eateries and wonder if it was the chicken or beef that caused the problem. We will know exactly which restaurant, supplier and diner to contact to quickly resolve the problem. The IoT and its billions of sensors will create an ambient intelligence network that thinks, senses and feels and contributes profoundly to the knowable universe. Things that used to make sense suddenly won’t, such as smoke detectors. Why do most smoke detectors do nothing more than make loud beeps if your life is in mortal danger because of fire? In the future, they will flash your bedroom lights to wake you, turn on your home stereo, play an MP3 audio file that loudly warns, “Fire, fire, fire.” They will also contact the fire department, call your neighbours (in case you are unconscious and in need of help), and automatically shut off flow to the gas appliances in the house. The byproduct of the IoT will be a living, breathing, global information grid, and technology will come alive in ways we’ve never seen before, except in science fiction movies. As we venture down the path toward ubiquitous computing, the results and implications of the phenomenon are likely to be mind-blowing. Just as the introduction of electricity was astonishing in its day, it eventually faded into the background, becoming an imperceptible, omnipresent medium in constant interaction with the physical world. Before we let this happen, and for all the promise of the IoT, we must ask critically important questions about this brave new world. For just as electricity can shock and kill, so too can billions of connected things networked online. One of the central premises of the IoT is that everyday objects will have the capacity to speak to us and to each other. This relies on a series of competing communications technologies and protocols, many of which are eminently hackable. Take radio-frequency identification (RFID) technology, considered by many the gateway to the IoT. Even if you are unfamiliar with the name, chances are you have already encountered it in your life, whether it’s the security ID card you use to swipe your way into your office, your “wave and pay” credit card, the key to your hotel room, your Oyster card. Even if you don’t use an RFID card for work, there’s a good chance you either have it or will soon have it embedded in the credit card sitting in your wallet. Hackers have been able to break into these as well, using cheap RFID readers available on eBay for just $50, tools that allow an attacker to wirelessly capture a target’s credit card number, expiration date and security code. Welcome to pocket picking 2.0. A much rarer breed of hacker targets the physical elements that make up a computer system, including the microchips, electronics, controllers, memory, circuits, components, transistors and sensors – core elements of the internet of things. These hackers attack a device’s firmware, the set of computer instructions present on every electronic device we encounter, including TVs, mobile phones, game consoles, digital cameras, network routers, alarm systems, CCTVs, USB drives, traffic lights, gas station pumps and smart home management systems. Before we add billions of hackable things and communicate with hackable data transmission protocols, important questions must be asked about the risks for the future of security, crime, terrorism, warfare and privacy. In the same way our every move online can be tracked, recorded, sold and monetised today, so too will that be possible in the near future in the physical world. Real space will become just like cyberspace. With the widespread adoption of more networked devices, what people do in their homes, cars, workplaces, schools and communities will be subjected to increased monitoring and analysis by the corporations making these devices. Of course these data will be resold to advertisers, data brokers and governments, providing an unprecedented view into our daily lives. Unfortunately, just like our social, mobile, locational and financial information, our IoT data will leak, providing further profound capabilities to stalkers and other miscreants interested in persistently tracking us. While it would certainly be possible to establish regulations and build privacy protocols to protect consumers from such activities, the greater likelihood is that every IoT-enabled device, whether an iron, vacuum, refrigerator, thermostat or lightbulb, will come with terms of service that grant manufacturers access to all your data. More troublingly, while it may be theoretically possible to log off in cyberspace, in your well-connected smart home there will be no “opt-out” provision. We may find ourselves interacting with thousands of little objects around us on a daily basis, each collecting seemingly innocuous bits of data 24/7, information these things will report to the cloud, where it will be processed, correlated, and reviewed. Your smart watch will reveal your lack of exercise to your health insurance company, your car will tell your insurer of your frequent speeding, and your dustbin will tell your local council that you are not following local recycling regulations. This is the “internet of stool pigeons”, and though it may sound far-fetched, it’s already happening. Progressive, one of the largest US auto insurance companies, offers discounted personalised rates based on your driving habits. “The better you drive, the more you can save,” according to its advertising. All drivers need to do to receive the lower pricing is agree to the installation of Progressive’s Snapshot black-box technology in their cars and to having their braking, acceleration and mileage persistently tracked. Knowing that Google can already read your Gmail, record your every web search, and track your physical location on your Android mobile phone, what new powerful insights into your personal life will the company develop when its entertainment system is in your car, its thermostat regulates the temperature in your home, and its smart watch monitors your physical activity? Not only will RFID and other IoT communications technologies track inanimate objects, they will be used for tracking living things as well. The British government has considered implanting RFID chips directly under the skin of prisoners, as is common practice with dogs. School officials across the US have begun embedding RFID chips in student identity cards, which pupils are required to wear at all times. In Contra Costa County, California, preschoolers are now required to wear basketball-style jerseys with electronic tracking devices built in that allow teachers and administrators to know exactly where each student is. According to school district officials, the RFID system saves “3,000 labour hours a year in tracking and processing students”. Meanwhile, the ability to track employees, how much time they take for lunch, the length of their toilet breaks and the number of widgets they produce will become easy. Moreover, even things such as words typed per minute, eye movements, total calls answered, respiration, time away from desk and attention to detail will be recorded. The result will be a modern workplace that is simultaneously more productive and more prison-like. At the scene of a suspected crime, police will be able to interrogate the refrigerator and ask the equivalent of, “Hey, buddy, did you see anything?” Child social workers will know there haven’t been any milk or nappies in the home, and the only thing stored in the fridge has been beer for the past week. The IoT also opens up the world for “perfect enforcement”. When sensors are everywhere and all data is tracked and recorded, it becomes more likely that you will receive a moving violation for going 26 miles per hour in a 25-mile-per-hour zone and get a parking ticket for being 17 seconds over on your meter. The former CIA director David Petraeus has noted that the IoT will be “transformational for clandestine tradecraft”. While the old model of corporate and government espionage might have involved hiding a bug under the table, tomorrow the very same information might be obtained by intercepting in real time the data sent from your Wi-Fi lightbulb to the lighting app on your smart phone. Thus the devices you thought were working for you may in fact be on somebody else’s payroll, particularly that of Crime, Inc.
For all the untold benefits of the IoT, its potential downsides are colossal. Adding 50bn new objects to the global information grid by 2020 means that each of these devices, for good or ill, will be able to potentially interact with the other 50bn connected objects on earth. The result will be 2.5 sextillion potential networked object-to-object interactions – a network so vast and complex it can scarcely be understood or modelled. The IoT will be a global network of unintended consequences and black swan events, ones that will do things nobody ever planned. In this world, it is impossible to know the consequences of connecting your home’s networked blender to the same information grid as an ambulance in Tokyo, a bridge in Sydney, or a Detroit auto manufacturer’s production line. The vast levels of cyber crime we currently face make it abundantly clear we cannot even adequately protect the standard desktops and laptops we presently have online, let alone the hundreds of millions of mobile phones and tablets we are adding annually. In what vision of the future, then, is it conceivable that we will be able to protect the next 50bn things, from pets to pacemakers to self-driving cars? The obvious reality is that we cannot. Our technological threat surface area is growing exponentially and we have no idea how to defend it effectively. The internet of things will become nothing more than the Internet of things to be hacked. Your friends have more friends than you. But wait there’s more not-so-good news. Not only are your friends friendlier and befriended more than you, they are also likely to be wealthier and happier. How can this be, you may ask? It’s all down to averaging and the mathematics of networks and their interconnections. This so-called Friendship Paradox manifests itself in the dynamics of all social networks — it applies online as well as in the real world. Back in 1991, the sociologist Scott Feld made a surprising discovery while studying the properties of social networks. Feld calculated the average number of friends that a person in the network has and compared this to the average number of friends that these friends had. Against all expectations it turned out that the second number is always bigger than the first. Or in other words, your friends have more friends than you do. Researchers have since observed the so-called friendship paradox in a wide variety of situations. On Facebook, your friends will have more friends than you have. On Twitter, your followers will have more followers than you do. And in real life, your sexual partners will have had more partners than you’ve had. At least, on average. Network scientists have long known that this paradoxical effect is the result of the topology of networks—how they are connected together. That’s why similar networks share the same paradoxical properties. But are your friends also happier than you are, or richer, or just better? That’s not so clear because happiness and wealth are not directly represented in the topology of a friendship network. So an interesting question is how far the paradox will go. Today, we get an answer thanks to the work of Young-Ho Eom at the University of Toulouse in France and Hang-Hyun Jo at Aalto University in Finland. These guys have evaluated the properties of different characteristics on networks and worked out the mathematical conditions that determine whether the paradox applies to them or not. Their short answer is yes: your friends probably are richer than you are. The paradox arises because numbers of friends people have are distributed in a way that follows a power law rather than an ordinary linear relationship. So most people have a few friends while a small number of people have lots of friends. It’s this second small group that causes the paradox. People with lots of friends are more likely to number among your friends in the first place. And when they do, they significantly raise the average number of friends that your friends have. That’s the reason that, on average, your friends have more friends than you do. But what of other characteristics, such as wealth and happiness, which are not represented by the network topology? To study other types of network, Eom and Jo looked at two academic networks in which scientists are linked if they have co-authored a scientific paper together. Each scientist is a node in the network and the links arise between scientists who have been co-authors. Sure enough, the paradox raises its head in this network too. If you are a scientist, your co-authors will have more co-authors than you, as reflected in the network topology. But curiously, they will also have more publications and more citations than you too. Eom and Jo call this the “generalized friendship paradox” and go on to derive the mathematical conditions in which it occurs. They say that when a paradox arises as a result of the way nodes are connected together, any other properties of these nodes demonstrate the same paradoxical nature, as long as they are correlated in certain way. As it turns out, number of publications and citations meet this criteria. And so too do wealth and happiness. So the answer is yes: your friends probably are richer and happier than you are. That has significant implications for the way people perceive themselves given that their friends will always seem happier, wealthier and more popular than they are. And the problem is likely to be worse in networks where this is easier to see. “This might be the reason why active online social networking service users are not happy,” say Eom and Jo, referring to other research that has found higher levels of unhappiness among social network users. So if you’re an active Facebook user feeling inadequate and unhappy because your friends seem to be doing better than you are, remember that almost everybody else on the network is in a similar position. 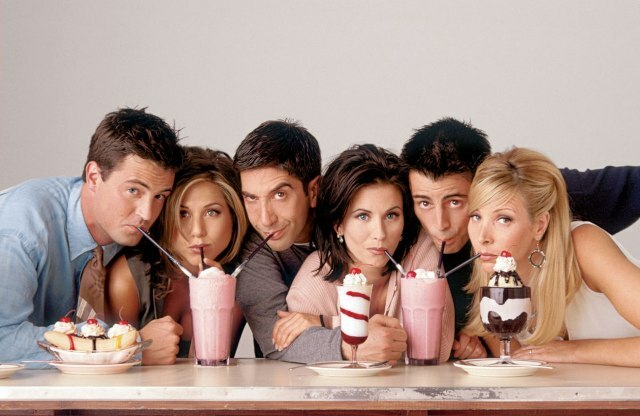 Image: Cast of the CBS TV show Friends. Courtesy of Vanity Fair, CBS and respective rights holders. Billions of people have access to the Internet. Now, whether a significant proportion of these do anything productive with this tremendous resource is open to debate — many preferring only to post pictures of their breakfasts, themselves or to watch last-minute’s viral video hit. Despite all these humans clogging up the Tubes of the Internets most traffic along the information superhighway is in fact not even human. Over 60 percent of all activity comes from computer systems, such as web crawlers, botnets, and increasingly, industrial control systems, ranging from security and monitoring devices, to in-home devices such as your thermostat, refrigerator, smart TV , smart toilet and toaster. So, soon Google will know what you eat and when, and your fridge will tell you what you should eat (or not) based on what it knows of your body mass index (BMI) from your bathroom scales. Jokes aside, the Internet of Things (IoT) promises to herald an even more significant information revolution over the coming decades as all our devices and machines, from home to farm to factory, are connected and inter-connected. These devices will inevitably be abandoned by their manufacturers, and the result will be lots of “smart” functionality—fridges that know what we buy and when, TVs that know what shows we watch—all connected to the Internet 24/7, all completely insecure. While the value of smart watches or washing machines isn’t entirely clear, at least some smart devices—I think most notably phones and TVs—make sense. The utility of the smartphone, an Internet-connected computer that fits in your pocket, is obvious. The growth of streaming media services means that your antenna or cable box are no longer the sole source of televisual programming, so TVs that can directly use these streaming services similarly have some appeal. But these smart features make the devices substantially more complex. Your smart TV is not really a TV so much as an all-in-one computer that runs Android, WebOS, or some custom operating system of the manufacturer’s invention. And where once it was purely a device for receiving data over a coax cable, it’s now equipped with bidirectional networking interfaces, exposing the Internet to the TV and the TV to the Internet. The result is a whole lot of exposure to security problems. Even if we assume that these devices ship with no known flaws—a questionable assumption in and of itself if SOHO routers are anything to judge by—a few months or years down the line, that will no longer be the case. Flaws and insecurities will be uncovered, and the software components of these smart devices will need to be updated to address those problems. They’ll need these updates for the lifetime of the device, too. Old software is routinely vulnerable to newly discovered flaws, so there’s no point in any reasonable timeframe at which it’s OK to stop updating the software. In addition to security, there’s also a question of utility. Netflix and Hulu may be hot today, but that may not be the case in five years’ time. New services will arrive; old ones will die out. Even if the service lineup remains the same, its underlying technology is unlikely to be static. In the future, Netflix, for example, might want to deprecate old APIs and replace them with new ones; Netflix apps will need to be updated to accommodate the changes. I can envision changes such as replacing the H.264 codec with H.265 (for reduced bandwidth and/or improved picture quality), which would similarly require updated software. To remain useful, app platforms need up-to-date apps. As such, for your smart device to remain safe, secure, and valuable, it needs a lifetime of software fixes and updates. Herein lies the problem, because if there’s one thing that companies like Samsung have demonstrated in the past, it’s a total unwillingness to provide a lifetime of software fixes and updates. Even smartphones, which are generally assumed to have a two-year lifecycle (with replacements driven by cheap or “free” contract-subsidized pricing), rarely receive updates for the full two years (Apple’s iPhone being the one notable exception). A typical smartphone bought today will remain useful and usable for at least three years, but its system software support will tend to dry up after just 18 months. This isn’t surprising, of course. Samsung doesn’t make any money from making your two-year-old phone better. Samsung makes its money when you buy a new Samsung phone. 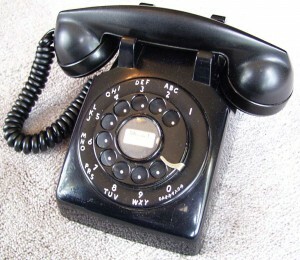 Improving the old phones with software updates would cost money, and that tends to limit sales of new phones. For Samsung, it’s lose-lose. Our fridges, cars, and TVs are not even on a two-year replacement cycle. Even if you do replace your TV after it’s a couple years old, you probably won’t throw the old one away. It will just migrate from the living room to the master bedroom, and then from the master bedroom to the kids’ room. Likewise, it’s rare that a three-year-old car is simply consigned to the scrap heap. It’s given away or sold off for a second, third, or fourth “life” as someone else’s primary vehicle. Your fridge and washing machine will probably be kept until they blow up or you move houses. These are all durable goods, kept for the long term without any equivalent to the smartphone carrier subsidy to promote premature replacement. If they’re going to be smart, software-powered devices, they’re going to need software lifecycles that are appropriate to their longevity. That costs money, it requires a commitment to providing support, and it does little or nothing to promote sales of the latest and greatest devices. In the software world, there are companies that provide this level of support—the Microsofts and IBMs of the world—but it tends to be restricted to companies that have at least one eye on the enterprise market. In the consumer space, you’re doing well if you’re getting updates and support five years down the line. Consumer software fixes a decade later are rare, especially if there’s no system of subscriptions or other recurring payments to monetize the updates. Of course, the companies building all these products have the perfect solution. Just replace all our stuff every 18-24 months. Fridge no longer getting updated? Not a problem. Just chuck out the still perfectly good fridge you have and buy a new one. This is, after all, the model that they already depend on for smartphones. Of course, it’s not really appropriate even to smartphones (a mid/high-end phone bought today will be just fine in three years), much less to stuff that will work well for 10 years. These devices will be abandoned by their manufacturers, and it’s inevitable that they are abandoned long before they cease to be useful. Superficially, this might seem to be no big deal. Sure, your TV might be insecure, but your NAT router will probably provide adequate protection, and while it wouldn’t be tremendously surprising to find that it has some passwords for online services or other personal information on it, TVs are sufficiently diverse that people are unlikely to expend too much effort targeting specific models. 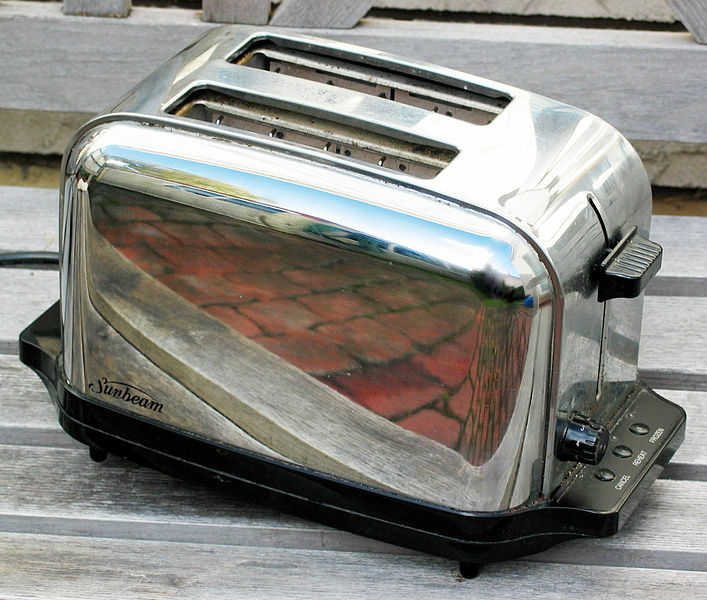 Image: A classically styled chrome two-slot automatic electric toaster. Courtesy of Wikipedia. Unplugging from the conveniences and obsessions of our age can be difficult, but not impossible. For those of you who have a demanding boss or needful relationships or lack the will to do away with the email, texts, tweets, voicemail, posts, SMS, likes and status messages there may still be (some) hope without having to go completely cold turkey. While we would recommend you retreat to a quiet cabin by a still pond in the dark woods, the tips below may help you unwind if you’re frazzled but shun the idea of a remote hideaway. While you’re at it, why not immerse yourself in a copy of Walden. You may never have read “Walden,” but you’re probably familiar with the premise: a guy with an ax builds a cabin in the woods and lives there for two years to tune out the inessential and discover himself. When Henry David Thoreau began his grand experiment, in 1845, he was about to turn 28—the age of a typical Instagram user today. Thoreau lived with his parents right before his move. During his sojourn, he returned home to do laundry. Thoreau’s circumstances, in other words, weren’t so different from those of today’s 20-somethings—which is why seeking tech advice from a 19th-century transcendentalist isn’t as far-fetched as it may sound. “We do not ride on the railroad; it rides upon us,” he wrote in “Walden.” That statement still rings true for those of us who have lived with the latest high-tech wonders long enough to realize how much concentration they end up zapping. “We do not use the Facebook; it uses us,” we might say. But even the average social-media curmudgeon’s views on gadgetry aren’t as extreme as those of Thoreau. Whereas he saw inventions “as improved means to an unimproved end,” most of us genuinely love our iPhones, Instagram feeds and on-demand video. We just don’t want them to take over our lives, lest we forget the joy of reading without the tempting interruption of email notifications, or the pleasure of watching just one good episode of a television show per sitting. Thankfully, we don’t have to go off the grid to achieve more balance. We can arrive at a saner modern existence simply by tweaking a few settings on our gadgets and the services we rely on. Why renounce civilization when technology makes it so easy to duck out for short stretches? Inspired by the writings of Thoreau, we looked for simple tools—the equivalent of Thoreau’s knife, ax, spade and wheelbarrow—to create the modern-day equivalent of a secluded cabin in the woods. Don’t worry: There’s still Wi-Fi. As your Facebook connections grow to include all 437 of the people you sort of knew in high school, it’s easy to get to the point where the site’s News Feed becomes a hub of oversharing—much of it accidental. (Your co-worker probably had no idea the site would post his results of the “Which Glee Character Are You?” quiz.) Adjusting a few settings will bring your feed back to a more Thoreauvian state. Facebook tries to figure out which posts will be most interesting to you, but nothing beats getting in there yourself and decluttering by hand. The process is like playing Whac-A-Mole, with your hammer aimed at the irrelevant posts that pop up in your News Feed. Unless you’re in the middle of a fierce match of Bejeweled Blitz, you can safely deselect “Games” and most likely “Music and Videos,” too. Go out on a limb and untick “Comments and Likes” to put the kibosh on musings and shout-outs about other people’s posts. You’ll probably want to leave the mysteriously named “Other Activity” checked, though; while it includes some yawn-inducing updates, the category also encompasses announcements of major life events, like engagements and births. Computers, smartphones and tablets are perfect for skimming TMZ, but for hunkering down with the sort of thoughtful text Thoreau would endorse, a dedicated ereader is the tech equivalent of a wood-paneled reading room. Although there are fancier models out there, the classic Kindle and Kindle Paperwhite are still tough to beat. Because their screens aren’t backlit, they don’t cause eye strain the way a tablet or color ereader can. While Amazon sells discounted models that display advertisements (each costs $20 less), don’t fall for the trap: The ads undermine the tranquility of the device. (If you already own an ad-supported Kindle, remove the ads for $20 using the settings page.) Also be sure to install the Send to Kindle plug-in for the Chrome and Firefox Web browers. It lets you beam long articles that you stumble upon online to the device, magically stripping away banner ads and other Web detritus in the process. Image: Henry David Thoreau, 1856. Courtesy of Wikipedia. The internet has the potential to make our current political process obsolete. A review of “The End of Politics” by British politician Douglas Carswell shows how connectedness provides a significant opportunity to reshape the political process, and in some cases completely undermine government, for the good. I think I can help you tackle this thought-provoking book. First of all, the title misleads. Enchanting though the idea will sound to many people, this is not about the end of politics. It is, after all, written by a Member of Parliament, Douglas Carswell (Con., Clacton) and he is fascinated by the subject. There’ll always be politics, he is saying, but not as we know it. Second, you don’t really need to read the first half. It is essentially a passionately expressed set of arguments about why our current political arrangements do not work. It is good stuff, but there is plenty of it in the more independent-minded newspapers most days. The important bit is Part Two, beginning on page 145 and running for a modest 119 pages. It is called “The Birth of iDemocracy”. Mr Carswell resembles those old barometers in which, in bad weather (Part One), a man with a mackintosh, an umbrella and a scowl comes out of the house. In good weather (Part Two), he pops out wearing a white suit, a straw hat and a broad smile. What makes him happy is the feeling that the digital revolution can restore to the people the power which, in the early days of the universal franchise, they possessed – and much, much more. He believes that the digital revolution has at last harnessed technology to express the “collective brain” of humanity. We develop our collective intelligence by exchanging the properties of our individual ones. Throughout history, we have been impeded in doing this by physical barriers, such as distance, and by artificial ones, such as priesthoods of bureaucrats and experts. Today, i-this and e-that are cutting out these middlemen. He quotes the internet sage, Clay Shirky: “Here comes everybody”. Mr Carswell directs magnificent scorn at the aides to David Cameron who briefed the media that the Prime Minister now has an iPad app which will allow him, at a stroke of his finger, “to judge the success or failure of ministers with reference to performance-related data”. A non-physical business, for instance, can often decide pretty freely where, for the purposes of taxation, it wants to live. Naturally, it will choose benign jurisdictions. Governments can try to ban it from doing so, but they will either fail, or find that they are cutting off their nose to spite their face. The very idea of a “tax base”, on which treasuries depend, wobbles when so much value lies in intellectual property and intellectual property is mobile. So taxes need to be flatter to keep their revenues up. If they are flatter, they will be paid by more people. Therefore it becomes much harder for government to grow, since most people do not want to pay more.